First volume of the anniversary book! We're releasing the "Nitro+CHiRAL 10 Years Archive" anniversary book in 3 volumes, chronicling the 10-year history of Nitro+CHiRAL! 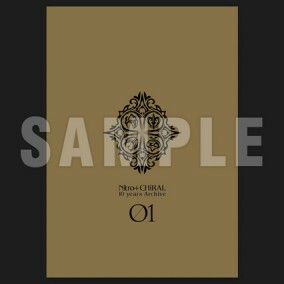 This first volume, "Nitro+CHiRAL 10 years Archive 01," focuses on TOGAINU NO CHI and Lamento -BEYOND THE VOID-. Includes illustrations from game packages and drama CDs, as well as supplementary art included in magazines and with merchandise, creating the most comprehensive visual guide to date. In addition, an array of guest artists, such as PSYCHO-PASS character designers Kyoji Asano and Nakayuki Onda, Mineo Maya, Noichi Itou, Naruko Hanaharu, and more have contributed illustrations and congratulatory comments, making it chock-full of new material! It also records a round-table discussion with scenario writer Kabura Fuchii, Nitroplus CEO/Producer Digitarou, writer Gen Urobuchi, and other staff who have been there since the beginning and continue to play a major role in the company. Who knows - now that 10 years have passed, they may even be able to talk a bit about the top secret development process!? A book you can enjoy as both a visual chronicle and a historical record. This is an essential collectors item for fans who have been with us these last 10 years, and will continue to support us in the decades to come. Does not include event bonus "Exclusive Sticker."